What is your role at Bread & Butter Concepts? I am currently the Executive Chef at Gram & Dun, and soon to be the Executive Chef at our newest concept, República, as well. How long have you been with Bread & Butter Concepts? Since October 2010. What has been your favorite memory at Bread & Butter Concepts thus far? My favorite memory is when Alan (CEO & Founder of Bread & Butter Concepts) asked me if I was ready to open a southern inspired gastropub on the plaza. I responded YES! It would be the first time I had the opportunity to create my own menu from scratch with ingredients and flavors that are true to my up bringing. I knew we could do big things I just never knew it would be something as big as it is. That, and cooking for the 2014 World Series and the Royals. Where are you from originally? I’m originally from North Carolina and moved to Kansas City back when I was in school for computer programming. My decision to move to KC was kind of on a whim. I dropped out of college on a Tuesday morning, packed up my stuff later that night, and drove to KC the next morning to stay with my dad. It was a decision I don’t regret one bit. Briefly take me through your career prior to Bread & Butter Concepts. I started off my career as a line cook at Grand St. Cafe for 2 years while going through the culinary apprenticeship at JCCC. PB&J Restaurants then offered me a job as a Sous Chef for YaYa’s in the northland. I worked with PB&J for about 4 years, then left to do a few restaurant openings and catering companies around KC. After that, I helped found Trezo Mare where I held positions as Sous Chef, Executive Chef, then General Manager. After some ownership changes I decided I wanted to take some time, but not even a week into my time off I got a call from Alan asking if I can start at BRGR Kitchen as the Executive Chef. The rest is history. Where does your inspiration in the kitchen come from? My granny is definitely the inspiration for my cooking. She’s getting up there in age, but every time I get the chance to visit her I always have her make one of her recipes and videotape it so I can keep those memories. Her chicken & dumplings and peanut brittle are some of the best I’ve ever had, and when I cook that for other people, it’s some of the best they’ve ever had. When I started developing the menu for Gram and Dun, that’s when I really got to go back to my southern roots. It wasn’t until then that I realized how much I was always in the kitchen with my mom and granny as a child. Even though her recipes don’t work in a high volume environment, I still like to adapt them and cook with those ideas and mindsets. 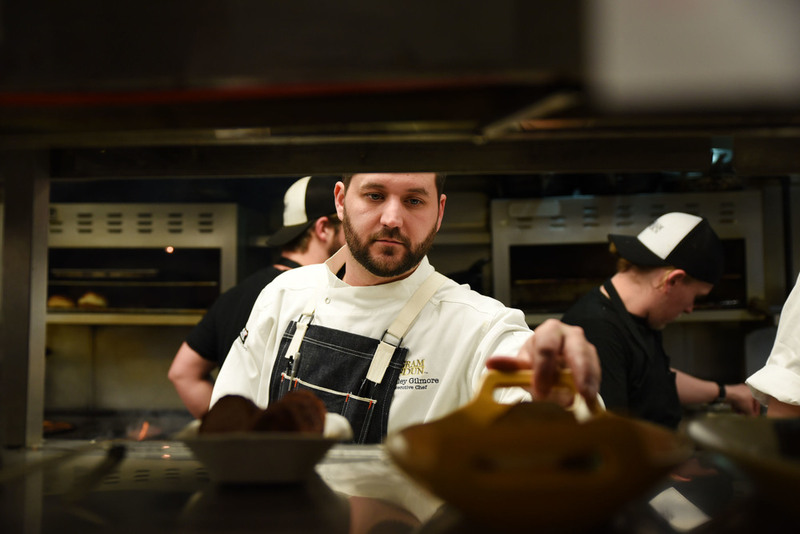 What is one thing being an Executive Chef at Gram & Dun has taught you? A lot of people think that chefs just cook, but I don’t actually cook a whole lot at Gram & Dun. We have a team of 35 kitchen employees and, day-to-day, it’s more about managing the team. I’ve had to learn how to keep my team happy, motivated, and keep them coming back every day. It’s very high-energy and repetitive, and everybody is different. You really have to get to know your staff to the point where you know the ins and outs of their lives, since they give you most of their life when they’re working 12-hour shifts. We're like family in the kitchen, so it's all about teamwork and comradery. What’s something about yourself that would surprise people? This rings true for most chefs, but I don’t like to cook at home a lot. I’d give anything for anyone else to cook for me. It doesn’t matter if it’s good or bad, I just want someone else to cook for me with as much passion as I cook for him or her. That means more to me than anything really.